Do customers need more payout options? Most people would bet that offering more payout methods would increase payment flows, but gauging the size of potential increases can be difficult. TransferWise’s recent introduction of a debit card for its “Borderless” multi-currency accounts offers a case study. TransferWise introduced the cards in April. Over the next four months, monthly FX flow increased 43% from $2.8bn/month to $4bn. “There has been a clear step change” said TransferWise in reference to the launch of the card. TransferWise is not the first to launch a debit card, but their experience shows the potential for companies that can integrate it into a broader product suite. Multi-currency accounts, wallets or simply the ability for a customer to store value are the precursor to offering a debit card payout option. While e-money regulation in the UK has allowed companies to hold customer funds without the need to obtain a full banking license, multi-currency accounts have yet to become a standard product and pairings with debit cards are rarer yet. 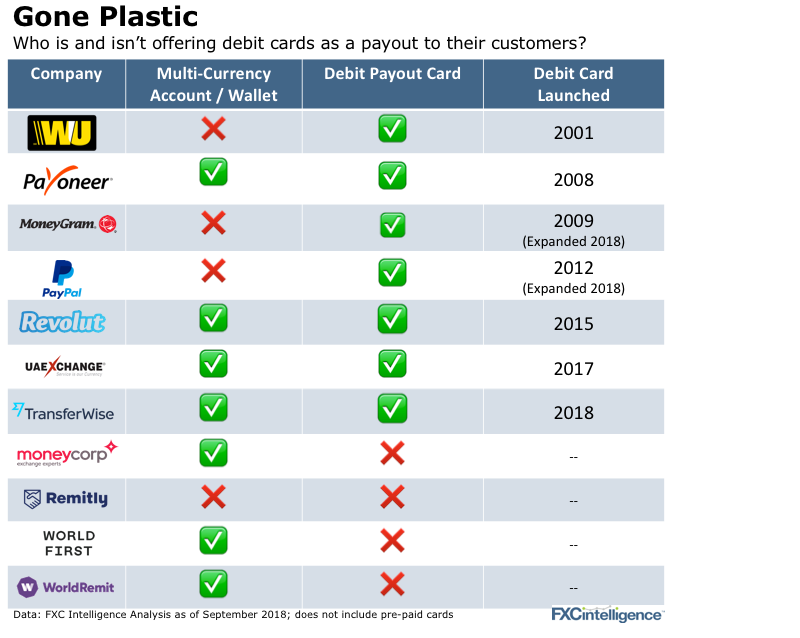 For start-up in the international payments space, “going plastic” is all about creating access and driving up customer numbers. What exactly is behind this growth? A quick history: PayPal is one of the most prominent payment companies to “go plastic,” but they weren’t the first. Western Union launched their debit card in 2001. Later, Payoneer launched their debit card in 2008. Moneygram followed suit in 2009. PayPal eventually caught up with the “PayPal My Cash Card,” launched in early 2012. The card initially enabled PayPal customers to use their funds online, and expanded to allow ATM withdrawals and brick and mortar payments, as well. As payment companies begin to add multi-currency accounts, debit cards that allow customers to easily use their funds are the logical next step. Which begs the question, who might be next? What it means now: 1) You need to convince customers to hold their funds with you first. Since payment companies are not banks and can’t offer interest-bearing accounts, other services need to be offered. 2) Debit cards alone are not unique and its a crowded marketplace. But if you can become one the places where a customer holds their money, this may not matter. 3) While the unbanked continue to be a large customer market, fintech has primarily grown out of appealing to customers who value convenience. Millennial customers, a great asset to the sector, don’t like cash and are driving the growth of the players above.